In the construction industry, there are generally minimum requirements for insulation in order for the building to be approved by an inspection agency. Because of this, if you are building a home, you can feel pretty confident that the house has at least the minimum amount of insulation required by law. However, you can discuss making an increase in the R-value with your builder. Although it will add to the building cost, it can reduce utility costs and make your new home more comfortable. The key is to understand just what insulation R-values are. Insulation R-values are a measure of thermal resistance. In other words, it is a measurement of the resistance of heat flow through the insulation. The higher the insulation R-value, the less heat flows through. The number that is stamped on a product is an indication of how it tested, but does not take into account how it is installed. 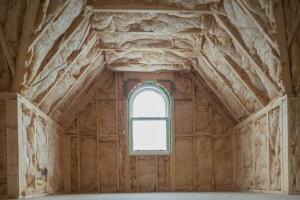 The important thing to realize when trying to insulate a new home is that it is important to be working with a knowledgeable and respectable insulation company and builder. If the insulation is installed incorrectly, it may not give the desired outcome. For example, doubling up on fiberglass batts will not increase their overall insulation R-value – in fact, it actually decreases it tremendously. Furthermore, each insulation type requires a certain amount of space to achieve its stated insulation R-values. Whether building a new home or working with an insulation company to add insulation to an existing home, make sure you understand exactly what is being installed and how it will be installed. If you choose to work with us at Polk County Insulation, we will be more than happy to answer all your questions about insulation R-values and show you the products we are installing.